You wouldn’t drink something contaminated, would you? How would you feel if you thought what you were drinking is healthy, but it turns out it is not? Did you know that even water becomes toxic when stored in a wrong container? Time is of the essence these days. In juggling between work and social life, you have little time to think about small things. There are days you hardly consider what you are drinking, what more assessing where you are drinking from. But, what you drink is not trivial—it is vital. The simple act of drinking clean water today will have a positive impact on your health tomorrow. But ensuring that your water remains clean should not be hard. Good thing there is Snapware Eco Flip and Eco Grip! Snapware Eco Flip and Eco Grip are designed with your health in mind. The bottles were developed in California, U.S.A. with hygienic materials that ensure healthy hydration. Worry less and live more with Snapware glass bottles! WHAT MAKES SNAPWARE GLASS BOTTLES HEALTHY? inhibiting bacterial growth. You can have peace of mind knowing that where you drink from is clean. The bottles are made with non-reactive glass, preventing chemical reactions that may occur between the bottle and the beverage. Water bottles made with reactive materials such as plastic have been found to release chemicals, such as diethylhexyl adipate and bisphenol A (BPA), into food and beverage products. These toxins are proven to have adverse effects in our bodies. According to research, diethylhexyl adipate has the potential to cause damage to liver and testes, and may cause cancer. Bisphenol A has been found to cause heart and liver disease, brain and hormone development problems, and even cancer. With Snapware glass bottles, you can now be certain that such chemicals do not get into your drinks. The bottles are able to withstand heating without releasing chemicals from the bottle. It has been warned time and again not to leave plastic water bottles in the car. Water contained in plastic bottles left in a hot car is no longer potable because chemicals from the bottle have already transferred to the water itself. With Snapware glass bottles, you no longer have to bring your bottle around all the time. You can leave Snapware glass bottle in the car with no health worries. The non-thread bottle opening prevents bacteria build-up. Screw-top mouth opening bottles retain saliva and residue from the beverage on its threads, making drinking from them unhygienic and unhealthy. Bottles that use straws also provide a breeding ground for molds and bacteria, as the straws are also a challenge to clean thoroughly. With the style of mouth opening of Snapware water bottles, saliva and other residue is easily cleaned off, preventing growth of molds and bacteria. Snapware glass bottles are a product of USA that adheres to US FDA standards. You can be assured that Snapware has passed food-grade quality assurance. Silicon sleeve of Eco Flip and neoprene sleeve of Eco Grip provide an additional protection from physical breakage and offers safe, easy and convenient grip of the bottle. 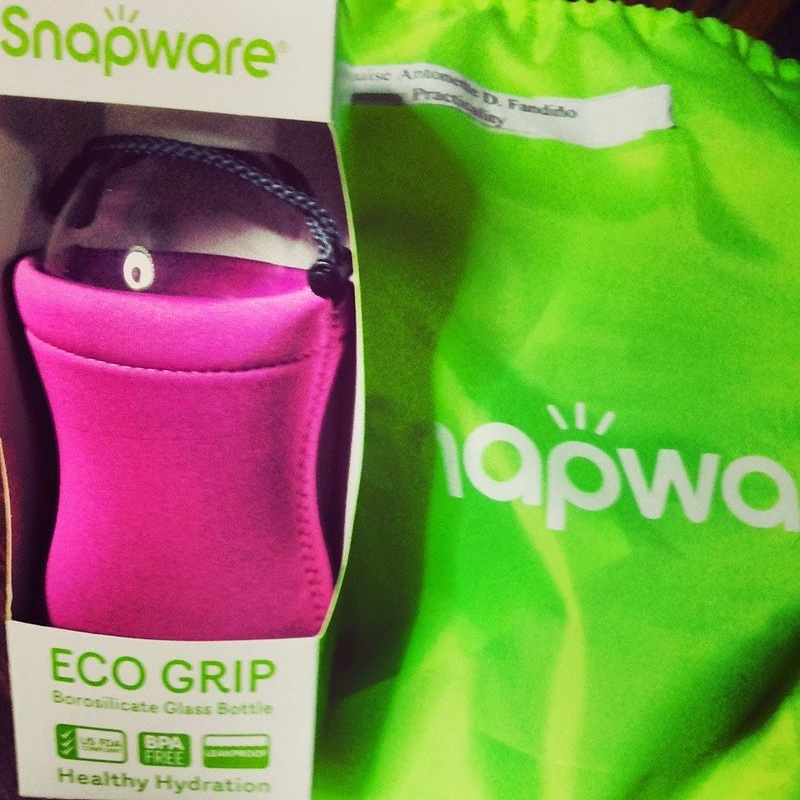 Keep your drinks clean and healthy with Snapware! We want you to make the healthy switch to Snapware. Whether you’re leading an active lifestyle, or making small steps to care for your health, Snapware is perfect for you. We care about your health, for you to love health, love life! Raffles and Co. Inc. is the exclusive distributor of Snapware glass beverage bottles in the Philippines. Our head office is located in 14/F Cyber One Plaza, Eastwood City 11 Eastwood Avenue, Eastwood City Cyber Park, Bagumbayan, Quezon City. You can contact us at 687 4715 loc. 33 or 34 or at marketing@raffles.com.ph. Snapware glass bottles are available in any of our branches or registered dealers. We have branches in Metro Luzon – (632) 576-7731 to 32, Cebu – (032) 253-8006, Cagayan de Oro – (08822) 727-612, and Davao – (082) 225-0717, making the healthy bottles accessible all around the Philippines.